The North Loop space that was home to Be’wiched Deli has been sitting empty for nearly a year. That’s going to change, soon. Inspiration came during a recent visit to New York City, when the couple spontaneously dropped in a slice shop. In other words, a different style from the wood-fired pizzas that make their Burch such a destination. At Snack Bar, pizza will be sold at a counter, and Becker is projecting that most of the sales in the heavily residential neighborhood will be takeout. But there will also be a communal table, as well as space for stand-up eating and drinking. As for the 90-seat lounge side of the operation, “You’ll be able to go in and get something small, with a glass of wine, but there will also be things on the menu so you can have a full meal,” said Becker, who is the James Beard Foundation’s 2011 winner of its Best Chef: Midwest award. 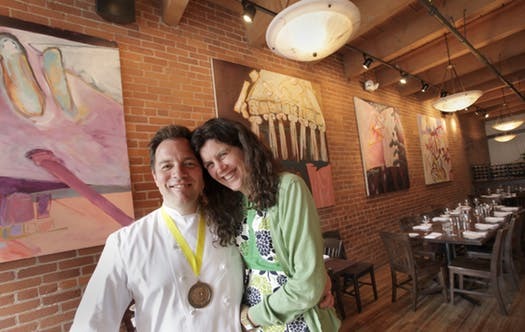 “This side is Nancy’s baby, she’s been driving the design, and the concept.” (That’s Becker and St. Pierre, above, in a Star Tribune file photo taken at 112 Eatery shortly after Becker’s James Beard win). The plan is to open at 4 p.m., and serve to midnight; on Sunday, closing hour will be 10 p.m. The bar will have a full liquor license. The space, which shares a lobby with 10-year-old Bar La Grassa, will be extensively renovated. Becker said that Snack Bar should debut by late summer.